I was commissioned to support the team at English National Ballet to develop and deliver a high profile symposium. 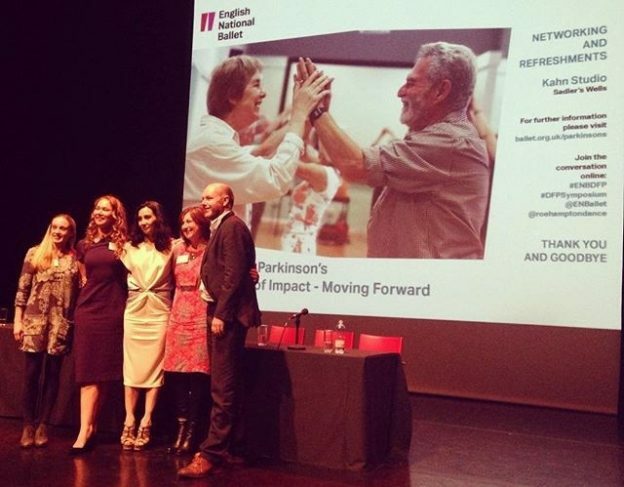 The event brought together partners and key speakers to launch the research report ‘Dance for Parkinson’s Evidence of Impact – Moving Forward’, the result of a three year project with the University of Roehampton. The symposium was introduced by Tamara Rojo CBE, Artistic Director of the ENB, followed by a range of presentations, panel discussions, audience questions and informal networking. The event took place at Sadler’s Wells and was live broadcast by Art Streaming TV to an international audience of nearly 900 people, including viewers in Canada, USA, Germany and the Netherlands. I was involved in the initial discussions between key partners to shape and develop the event, and then created and managed the Event Plan, liaised with the speakers and venue, and worked with the team on the day to deliver the symposium. See the Storify from the event here. I thoroughly enjoyed collaborating with Catherine on the Dance for Parkinson’s Symposium. An event not short of its complexities, Catherine kept the project on track with her patient and meticulous methods of project management, open and assertive communication skills, and her kind and generous spirit. She is lovely to work with and I hope we work together again soon.